I finally had time to sit down and write out how my day came about on July 15, 2007. 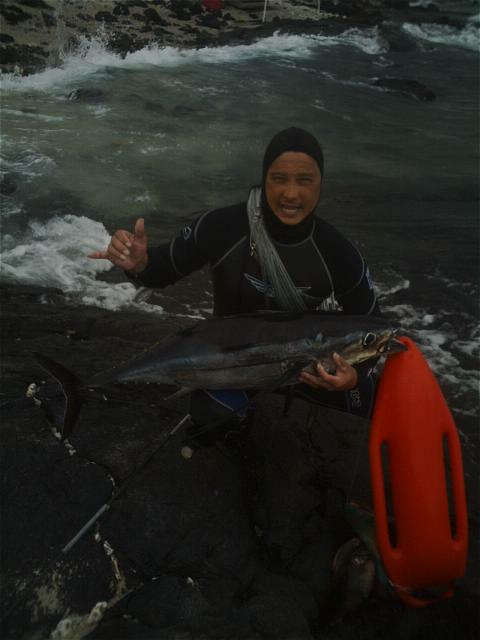 It was Sunday morning July 15 and I had planned to go diving with my son to look for He'e for his wedding reception. Weather was kind of gloomy but the water was fairly smooth. I headed down to a local spot we call Pine Trees where I met up with my son Alika. Alika and his friend had already did a morning dive and he was planning on jumping in with me again. Alika realized that he was too tired after his first dive and decided to not do a second dive. I decided to still go diving so I jumped in my truck and drove further to the end of Pine Trees where there were no boats or activities in the water. That's where the adventure began. The first 2 hours of my dive was fairly slow. I was disappointed that there wasn't any He'e around that I was hoping for. I decided to start shooting for reef fish. As I zig zagged from shallow waters out to the ledge, I continued to search for He'e. 3 hours into the dive, I found myself south of Kaloko Fishpond and about 1/2 mile from Honokohau Harbor when I ran across an opelu kala school. I shot 6 of them and decided to turn around and make my way back to shore. I knew I had a long swim ahead of me and my stringer was feeling heavy. I lined myself up from the point of Kaloko Fishpond to the point of where my truck was and started to head back. I continued to spear reef fish on the way back. I started to feel disappointed because I had only caught one He'e at that time for my son's wedding. As I looked ahead of me I saw a shine in the water and I thought it was a big Omilu. I was in about 20 to 25 ft. of water and this shine was moving parallel & away from me. After seeing his side fins wide open, his dark back and silver sides I realized that it was a tuna. The tuna then took a turn and came towards me. I was really excited & I took a good breath and went down. The tuna was moving fast but I was able to get off a good & steady shot. I shot him about 12in. behind the head, a spine shot. My shaft totally penetrated the tuna all the way through. I knew it was a good shot & I braced myself for the run of my life, but like I said, I spined him. As the tuna quivered, I went down to stab him in the brain with my knife to secure him. As I brought him up to the surface, I had one arm holding the knife in him and my other arm wrapped around the tuna. My arm barely made it around the tuna. I removed the knife and put the tuna on my kui. I never really knew how dense weight a tuna is in the water. At this point all I could think about was getting this tuna back to shore. After 1 1/2 hours of swimming & watching if any sharks would come and take this tuna, I finally made it to shore safely. When I got out of the water I saw a young man & I asked him to take my picture with my camera phone. He couldn't believe his eyes. He thought my fish was a large Aku at first. I then called my wife and told her that she wouldn't believe what I had caught. As I told her the story, she suggested that I go to Honokahau Harbor to weigh my fish. So I did. 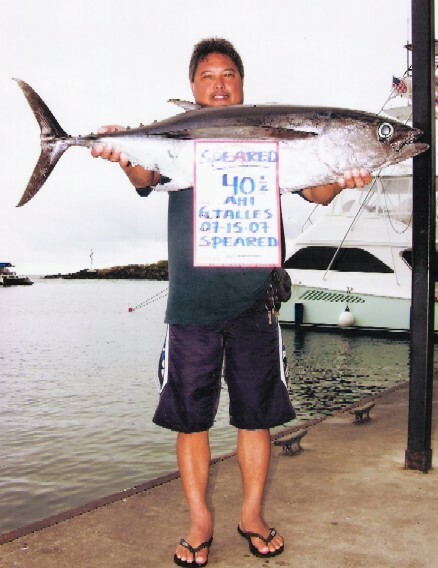 I stopped by the charter desk and they weighed my tuna in at 40.5lbs. As I went back to my truck to put the tuna in the cooler, I met Mark Barville. 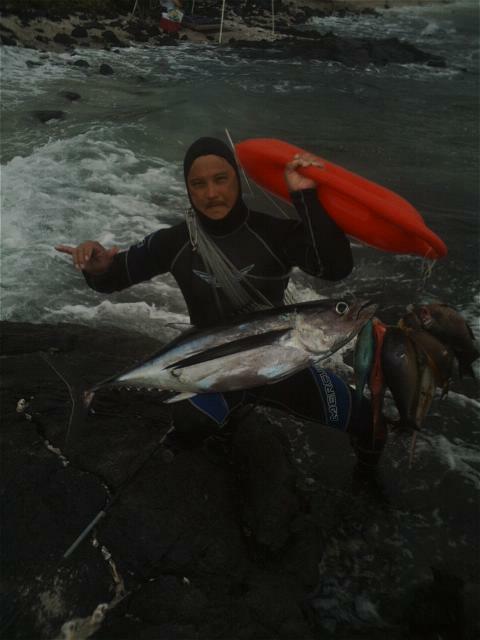 He couldn't believe that I had speared this tuna free diving from offshore. He thought I was pulling his leg. He asked where did I spear it and I told him and he still didn't believe me so I opened my cooler to show him the rest of my catch and then showed him the picture on my cellphone that the young man took when I first came in to shore. I showed Mark my spear gun and told him it was a Daryl Wong gun with my own home made shaft. Mark gave me his card and asked me to send him pictures along with a story so that he could share it with Daryl. I am very proud to own a Daryl Wong gun, it has been very reliable and has caught many different fish for me. This spear gun has caught 10lb Uku's, 35lb. Ulua, many Uhu's and lots of reef fish to name a few and not to mention the75lb ulua that got away. I may not have caught the He'e that I wanted to but I did have a great day in the ocean. Thank you Daryl, I really enjoy your spear gun and the sport of free diving.